Peyton Hall Magalhaes was born January 28, 1998. He began playing the cello at the age of 6. 2004-2005 he studied under Ričardas Paškauskas at the Šilutė School of Music and Art in Silute, Lithuania. He studied under Hannah Schmidt at Bellevue’s School of Performing Arts in Memphis, Tennessee between 2005-2006. From 2006 to now he has studied under Ramutė Kalnėnaitė at the National M.K. Čiurlionis School of Arts in Vilnius, Lithuania. Peyton has taken master classes with: Eleonora Testeleca of Latvia; Hyoung Won Chang of South Korea; Leonid Gorokhov Russia/Germany, and Nicholas Jones of England, Sergejus Kalienov, Anatolijus Senderovas and performed with the Lithuanian National Symphony Orchestra as a soloist in 2008, the Annie Moses Band of Nashville, Tennessee in 2014 & 2015 at the Grand Ole Opry- he also performed with them in their PBS Special “The Art of the Love Song”; the band Dens of Richmond, Virginia in 2015, the Alytus Music School Orchestra as a soloist in 2014, the National M.K. 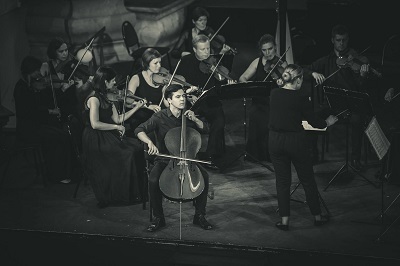 Čiurlionis School of Arts Orchestra 2012-2017- first chair 2015-2017, the Vytautis Didysis (Vytautas the Great)University Chamber Orchestra of Kaunas, Lithuania as a soloist 2014, the Svento Kristoforo (Saint Christopher) Chamber Orchestra as a soloist in 2016 and invited to perform, with the Baroque Opera Theater performing the Lithuanian premiere of Vivaldi’s La Fida Ninfa, December 15, 2016 the Lithuanian National Philharmonic as a soloist in the spring 2017. He has performed with such conductors as Jung-Ho Pak of the Cape Symphony Orchestra, Camp Kirkland of Nashville, Tennessee; Donatas Katkus, (the late) Pranas Stepanovas, Martynas Staškus, and Martynas Stakionis of Vilnius, Lithuania. Robertas Bliskevicius, of Kaunas Lithuania. He also performed at the Hermitage Museum in St. Petersburg, Russia 2016 on a Lithuanian diplomatic mission, The Grand Ole Opry, the Blue Bird Café and the Cannery Ballroom in Nashville, Tennessee 2014 & 2015, the Kaunas Philharmonic in Kaunas, Lithuania 2014, the Palace of Congress 2008-2016 in Vilnius, Lithuania, the Lithuanian National Philharmonic 2013-2016 in Vilnius, Lithuania. In the fall of 2015, Peyton was chosen as concert master for his school’s 70-anniversary celebration concert. He was also the 1st chair for the Lithuania National Youth Song Festival. You can listen to Peyton here. If you are interested in working with Peyton, please get in touch with the EMCY Office.